You are currently browsing EPKPhoto's Tidbits archives for January, 2009. This past quarter, I worked with a group of students to organize the annual RIT School of Photo Arts and Sciences Holiday Auction. I was one of three leaders in the group that solicited for donations, organized volunteers, and conducted the event. It ended up being a great success and brought in around $7400 to be split among two student organizations and a local charity, the Rochester Community Darkroom. RIT's college newspaper, Reporter, ran an article about the event. I was quoted in it, so be sure to give the article a read. For those of you who haven't seen the news, Palm introduced a revolutionary new device and platform at CES on January 10th. They call the device the Palm Pre, and the platform webOS. This announcement is easily the most groundbreaking and exciting news that Palm has made since I have followed the company. For those who don't know, I have been a Palm addict for the past 7 or so years. I owned three different models in the Tungsten line, and enjoyed (and felt limited) using a Treo 700p for two years before I bought an iPhone 3G this past fall. I never succumbed to owning a PocketPC or Windows Mobile device, but kept faithful to the true Palm OS. This certainly was not easy as Palm faced hard times over the past few years. Innovation at the company was stifled by mergers, reorganization, and promises of a brighter future. Well, friends, that future has come. 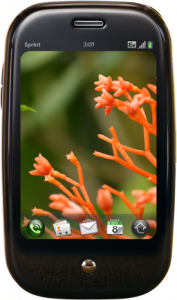 The webOS looks like it is well worth the wait. As an iPhone owner, I find myself drooling at the design of the new operating system. Palm has always been the best at balancing openness with style and simplicity. I really can't explain how cool and functional the new device looks. I encourage you to check it out yourself by watching (or skimming) the Palm Pre launch video on Palm's website. Now I just have to wait for the device to come to AT&T (Sprint is the launch partner…serves me right for switching).